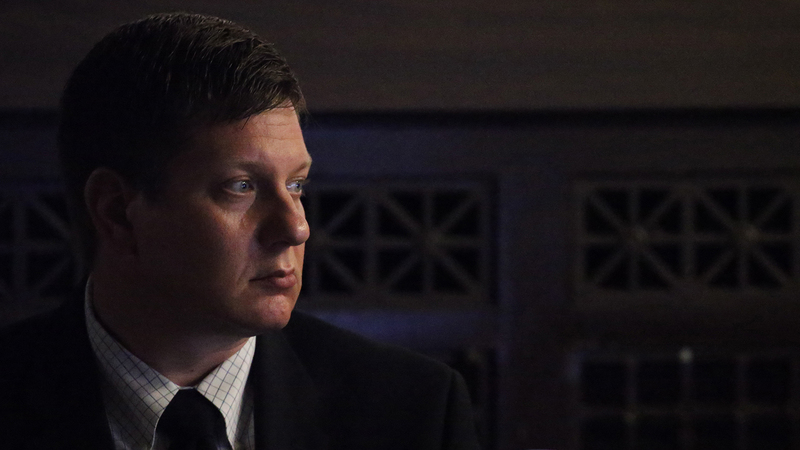 The trial of suspended Chicago police Officer Jason Van Dyke will remain in Cook County despite defense arguments that finding a fair and impartial jury in the county is impossible. Cook County Judge Vincent Gaughan on Monday denied defense requests to strike the entire jury pool and for a change of venue on the first day of arguments in the high-profile murder case. Van Dyke’s attorneys have argued that jurors were prejudiced by protesters gathered outside the Leighton Criminal Court Building who labeled the defendant as, among other things, a “racist murderer.” Attorneys agreed on 12 jurors and five alternates during three days of individual jury selection last week. But lead defense attorney Daniel Herbert argued the jurors can’t be trusted to remain impartial and could face threats of violence should they return a not guilty verdict. Van Dyke sat quietly on Monday, hands clasped, staring ahead at an empty jury box as throngs of attorneys, media and the public entered and exited the fifth-floor courtroom where he will be tried on murder charges in the 2014 shooting death of Laquan McDonald. The suspended Chicago police officer maintained that pose for much of the morning before the start of the hearing, breaking rarely to steal a glance at the gallery or for a hearty handshake with Herbert. Herbert argued these protests, along with pervasive media coverage, has made a fair trial inside Cook County impossible. He claimed his client would likely have to prove his innocence to this jury rather than prosecutors proving guilt. Herbert asked potential jurors last week whether they would feel comfortable returning home to their neighborhoods in the event they acquit Van Dyke. Selected jurors said they would be comfortable, and told the judge they can give Van Dyke a fair trial. Special prosecutors argued that a properly selected jury is the “cornerstone of our legal system” and that the selected jurors should be believed when they say they can be fair. Gaughan ultimately agreed. “I have faith in the citizens of Cook County,” he said. Van Dyke shot McDonald 16 times during a police call on a Southwest Side street in October 2014. McDonald was carrying a knife and had slashed at a Chicago police cruiser. Dashcam footage of the shooting appeared to show he was walking away from Van Dyke and his partner when the shots were fired. In his opening statement, special prosecutor Joseph McMahon outlined what led up to the fatal shooting, including an initial police call about McDonald attempting to break into trucks in a Southwest Side lot. McMahon showed security tape of police following McDonald down a nearby street as well as the dashcam footage of the shooting itself. McMahon acknowledged that police do have a legal right to take a life, but only when it’s necessary. But he told the jury not a single shot Van Dyke fired was needed. “What was necessary that night was the arrest of Laquan McDonald,” he said, “but it was not necessary to kill Laquan to do so." During the defense opening, Herbert claimed Van Dyke is not a murderer – he didn’t plan to kill McDonald – but instead acted according to his training, arguing his client didn’t even know if he had struck McDonald after pulling the trigger 16 times. He painted McDonald as acting “out of control” and reacting violently when confronted before the shooting. McDonald had stabbed at a civilian in the area and used his knife to pop the tire of a police cruiser in the minutes before his death, according to Herbert, who told jurors to look at the situation through the eyes of a trained officer. In testifying for the prosecution, Chicago police Officer Joseph McElligott described the moments leading up to the shooting as “organized chaos” and said Van Dyke appeared to be “in shock” after killing McDonald. McElligott and his partner, Thomas Gaffney, were the first officers to arrive on the scene following a civilian report that McDonald had been trying to break into trucks on the Southwest Side. Gaffney remained inside his squad vehicle, but McElligott got out on foot and drew his weapon once he realized McDonald was armed with a knife. Surveillance footage shows them pursuing McDonald for about three blocks as the teen repeatedly displayed the knife in his hand and eventually stabbed at their vehicle. When asked why he didn’t fire at the teen, McElligott testified that police were trying to buy time until they could get a Taser to use at the scene. McElligott didn’t witness the shooting itself, but said he heard at least 10 gunshots within 30 seconds of Van Dyke and his partner Joseph Walsh passing him in their vehicle on the street. Upon arriving at the scene of the shooting, McElligott said Van Dyke “looked, like, in shock” and still had his gun in hand. Testimony concluded Monday with Chicago police Officer Dora Fontaine, a 16-year veteran who arrived on the scene as Van Dyke was shooting McDonald. She can be seen exiting her squad vehicle in dashcam footage from Van Dyke’s vehicle and testified that she could see smoke coming from McDonald’s body as he continued to be shot. Fontaine said she fired no shots and didn’t even draw her weapon as she saw McDonald laying on the ground, saying she never saw the teen raise the knife in a threatening manner. But defense attorneys questioned her about grand jury testimony she gave in 2015 in which she said she believed McDonald still posed a risk even as he lay dying because he had his knife in hand. The trial will resume Tuesday at 10 a.m. Find full coverage of the trial here. Below, a timeline of events surrounding the shooting of Laquan McDonald.